An exciting new Wildfilm History Archive will be coming to Special Collections in the University of Bristol Library, thanks to a grant from the Wellcome Trust. 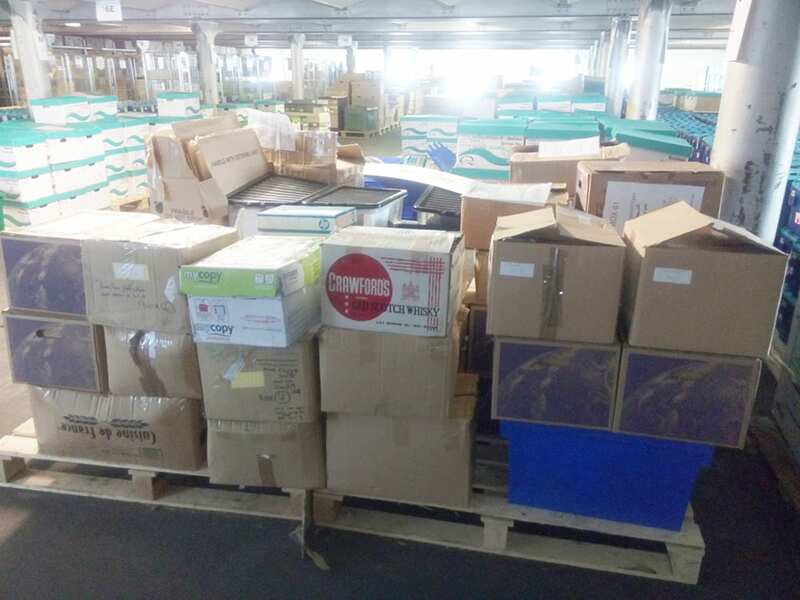 Here’s the archive as it is now, all boxed up in storage. 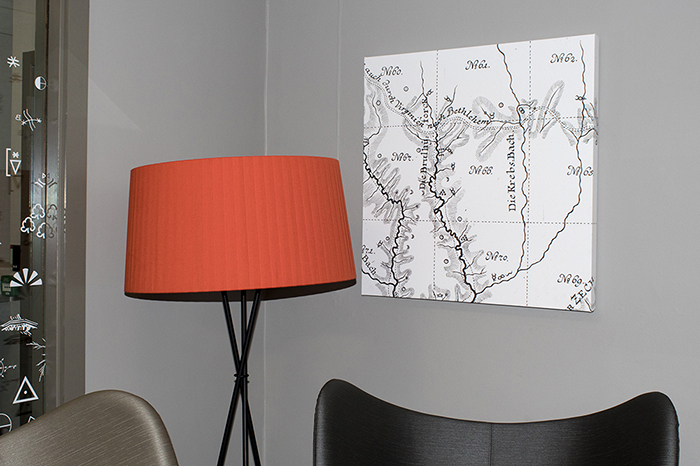 We’ll be unpacking, exploring and eventually making the contents accessible. The Wildfilm History Project will officially start on the 1st April 2019 and run for two years. The project will catalogue, conserve and make available a rich, diverse and important collection of wildlife filmmaking materials which document the changing cultural context of wildlife film making and how it has shaped our historical, social and cultural understanding of the natural world, as well as the growing appreciation of conservation issues and the broad public understanding of science. Create a detailed catalogue of the wide range of materials contained within the archive, including some of the most important wildlife films of the last hundred years. 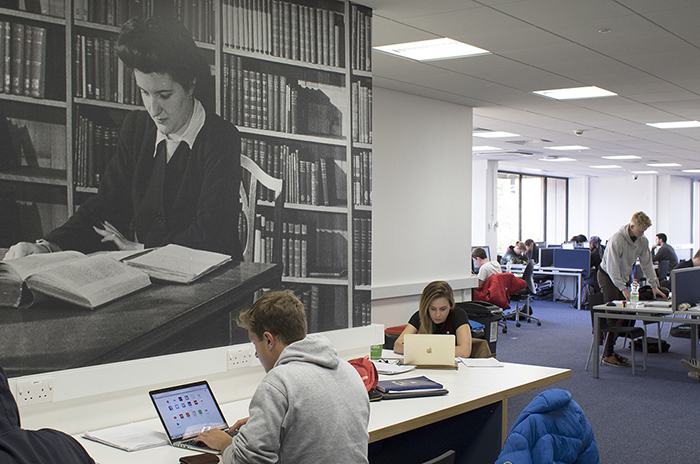 Digitise and provide access to a prioritised selection of the archive and make this publicly available (where rights allow) through the University’s Digital Archival Management system. 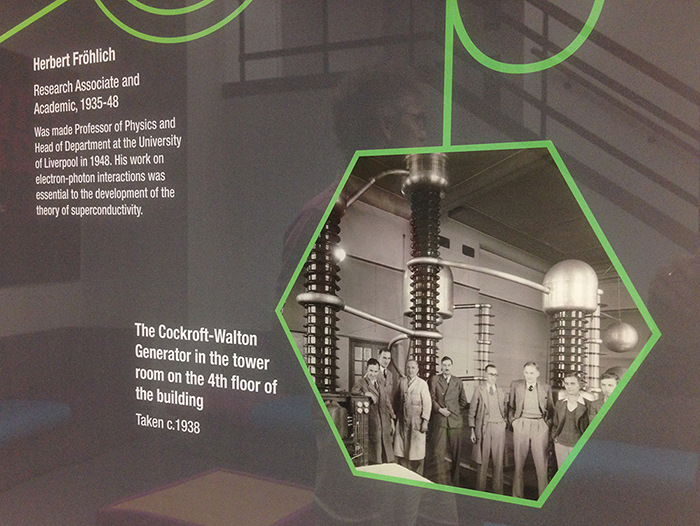 Ensure the physical and digital archive is preserved to enable long-term access for researchers and the wider public. The University of Bristol is home to the Centre for Environmental Humanities and from our initial discussions with researchers from Bristol and more widely there is clearly already strong research and teaching interest in the archive, as well as support from outside agencies such as Wildscreen and the BBC Natural History Unit. This entry was posted in Uncategorized on January 14, 2019 by Jamie Carstairs. 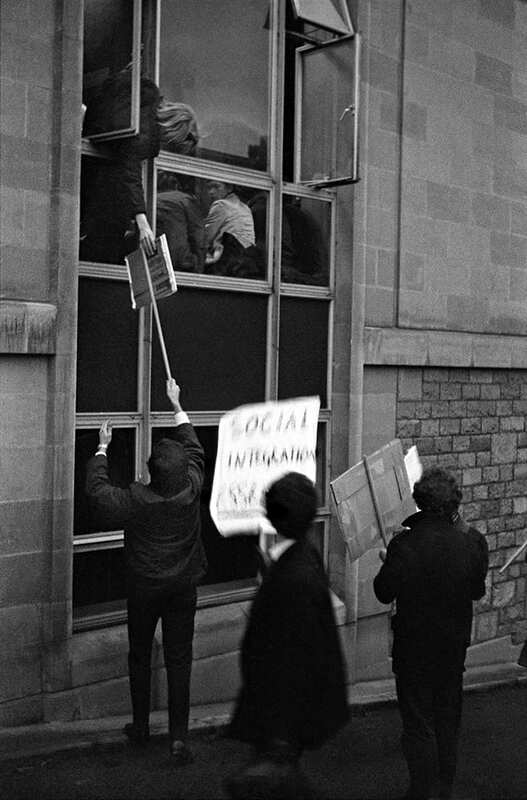 5 December 2018 marks the fiftieth anniversary of the start of a sit-in by a group of University of Bristol students, who occupied Senate House for eleven days, until 16 December 1968. 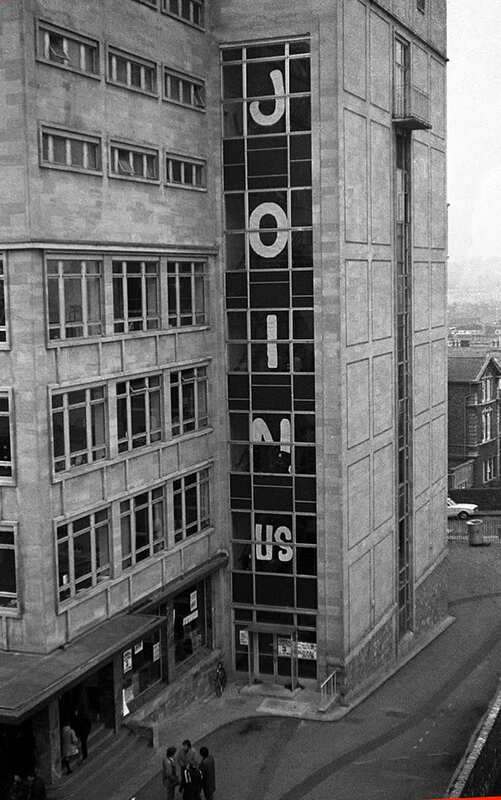 The students were campaigning for a greater say in the running of the University and for the University of Bristol Student Union to be open to students from other education establishments in the city. 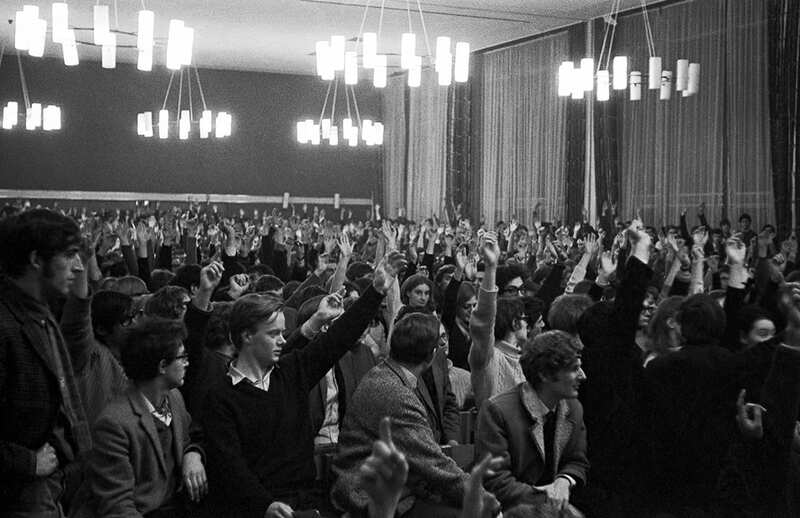 Whilst the sit-in took place, other students held a mass meeting in the Anson Rooms (Students Union) calling for the sit-in to end. 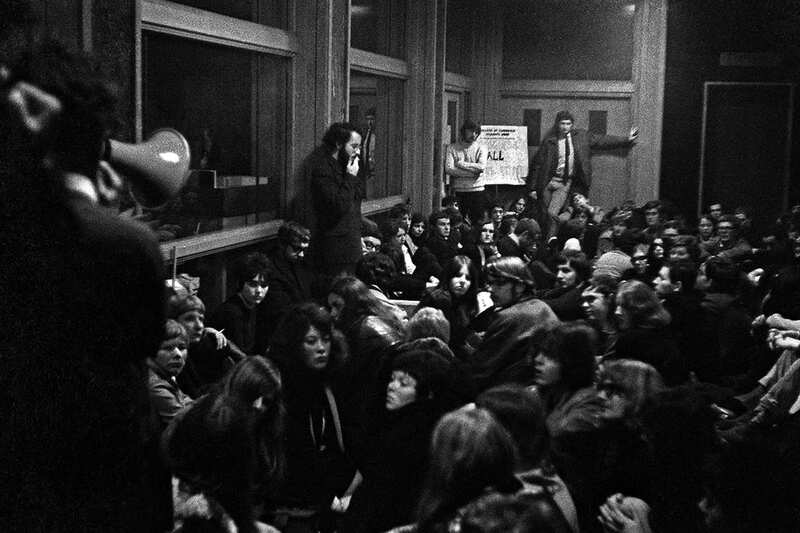 The Union Council asked the 400+ students to leave Senate House and a Joint Staff Student Working Party was set up under Professor Roderick Collar. Editions of Nonesuch (to be found in Special Collections) dating from December 1968, cover these events as do other printed and archival material. 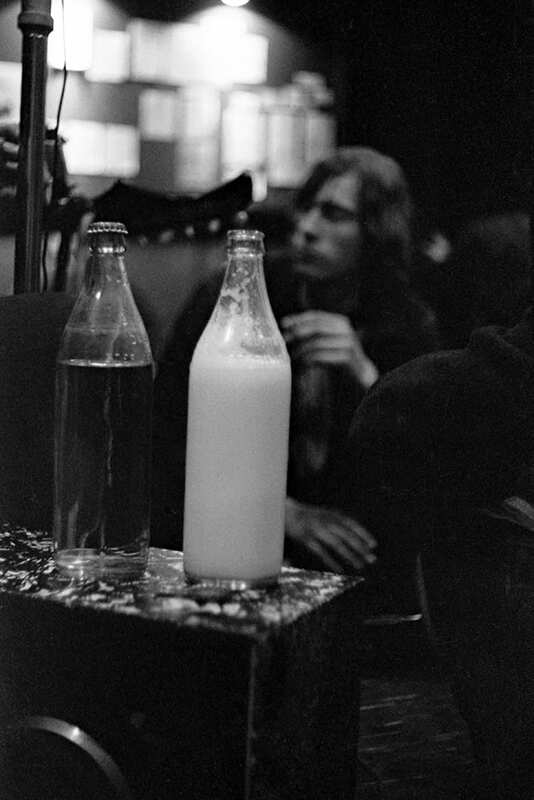 Tony Byers, a University of Bristol student who photographed many of these events at the time, deposited his archive of photographs (DM2269) in Special Collections. Here we share some of his photographs and press coverage. 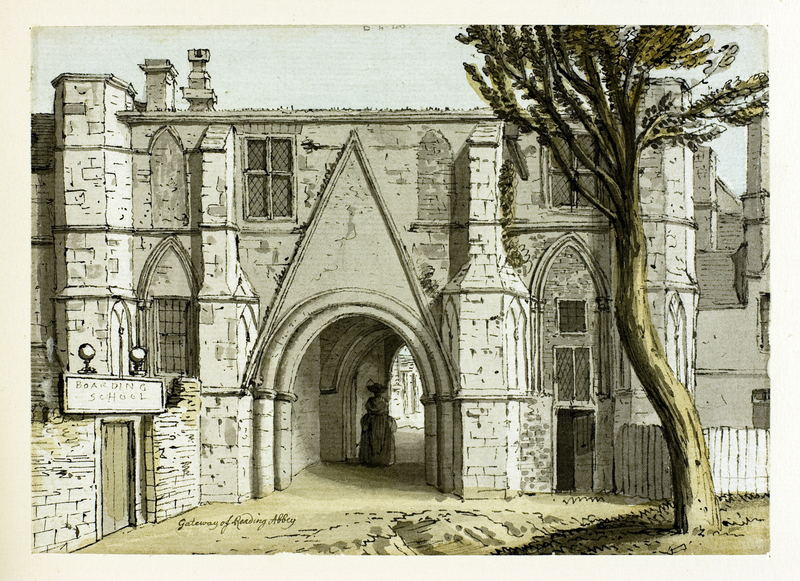 Sue Tate and Kevin Whitson gave a talk in May 2018 on the topic for the Bristol Radical History Group. 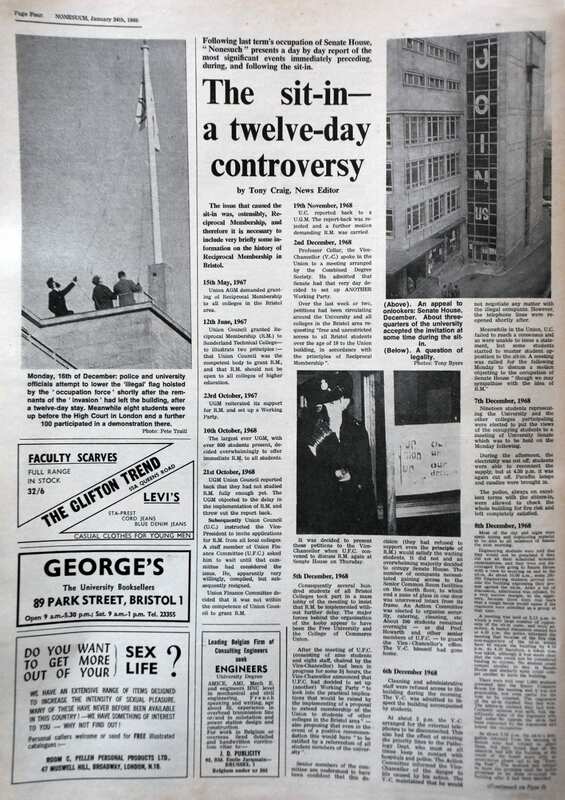 DM1635: Documents and press coverage of the student unrest of 1968 and the occupation/sit-in of Senate House, including the controversy over reciprocal membership of the Student’s Union. Includes the Complicity statement, copies of the Informal newsletter and Nonesuch, general newspaper articles, ‘conspiratorial’ publications such as ‘Open Conspiracy’, letters, minutes of meetings and statements, 1969-1969. 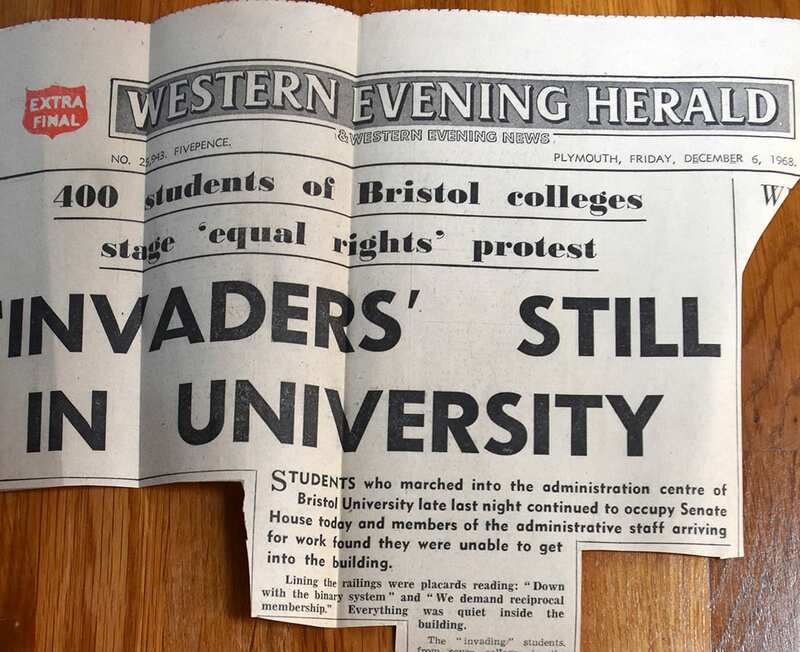 Also, newspaper coverage of student unrest in other Universities. 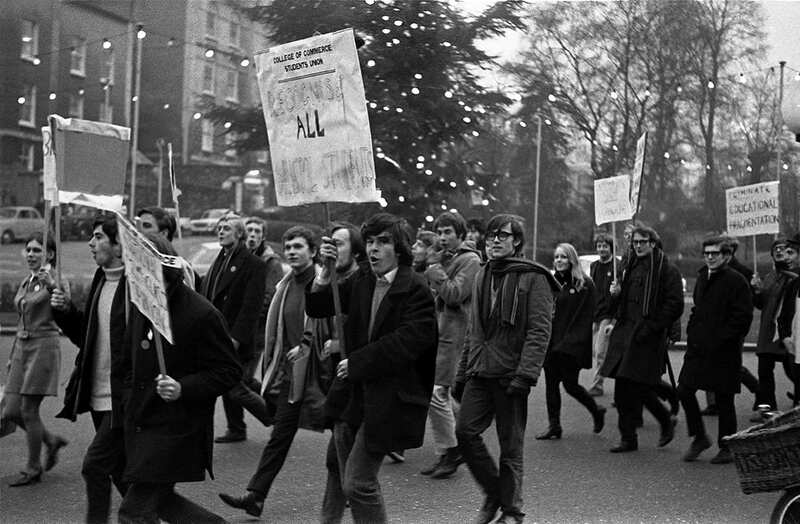 DM2476, Transcript of a lecture by Gordon Strong about the University of Bristol 1968 sit-in, 16 February 2006. All photographs are copyrighted to Tony Byers. This entry was posted in Uncategorized on December 4, 2018 by Jamie Carstairs. Papers relating to Margaret Leach (DM2701). 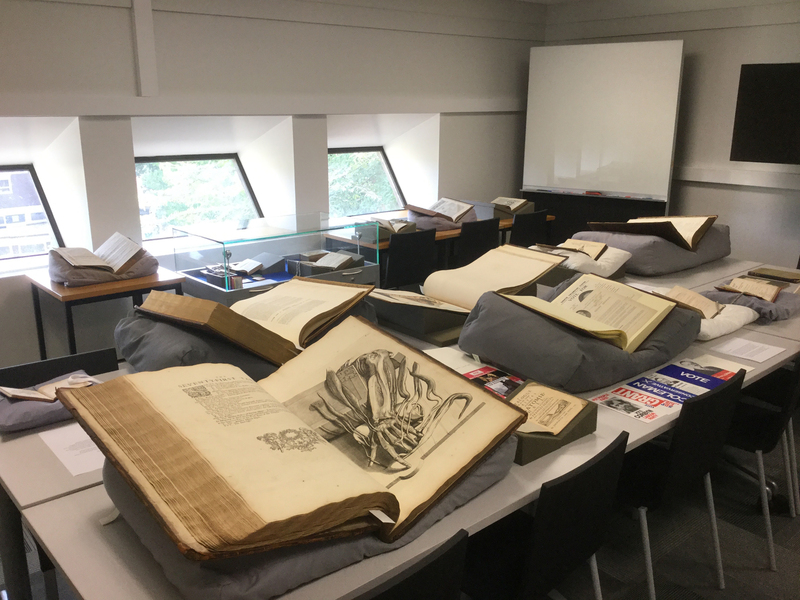 This summer I spent a wonderful two months as an intern with the Special Collections team, based in the Arts and Social Sciences Library. My main responsibility was supervising the Reading Room. This meant getting to grips with the archive’s vast collection and retrieving documents for readers. 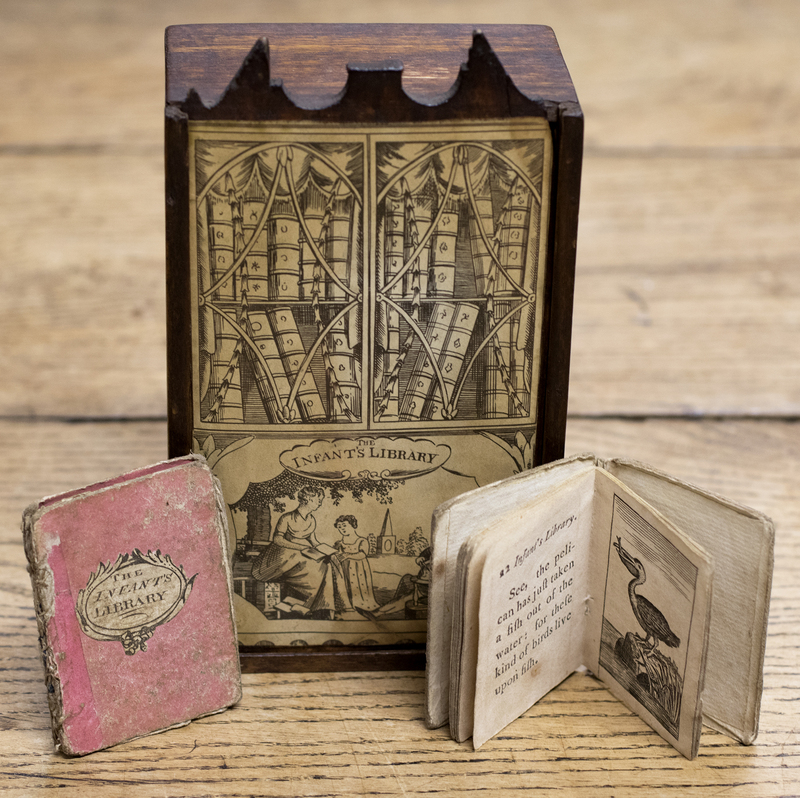 I became familiar with some of the archive’s most fascinating collections, from feminist archive posters to the 18th Century diaries of the Pinney family (DM58). 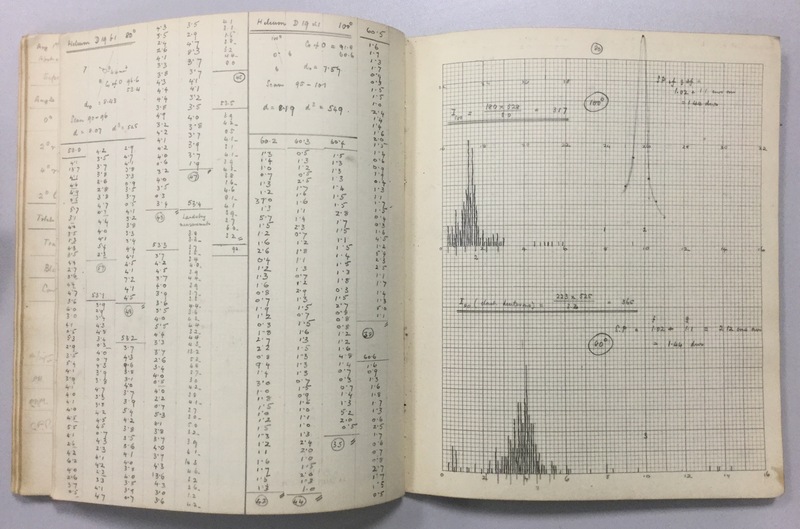 Another of my key responsibilities was to work through Special Collection’s paper catalogues, eventually entering the data into the archive software CALM so that it could be searchable by the public on the Special Collections online catalogue. John Pinney’s Letter concerning Pero’s health. Pinney Letter Book 14, page 74 (DM58). 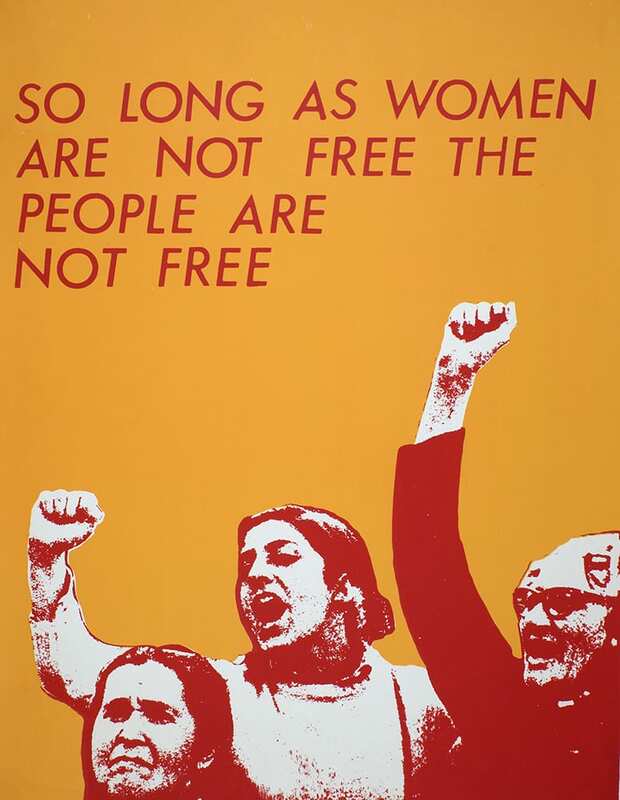 Poster in the Feminist Archive South Collection (DM2123). I was also given the opportunity to catalogue the papers of Margaret Leach (DM2701), which were donated to the archive several years ago and form part of the Long Ashton Research Station collection. 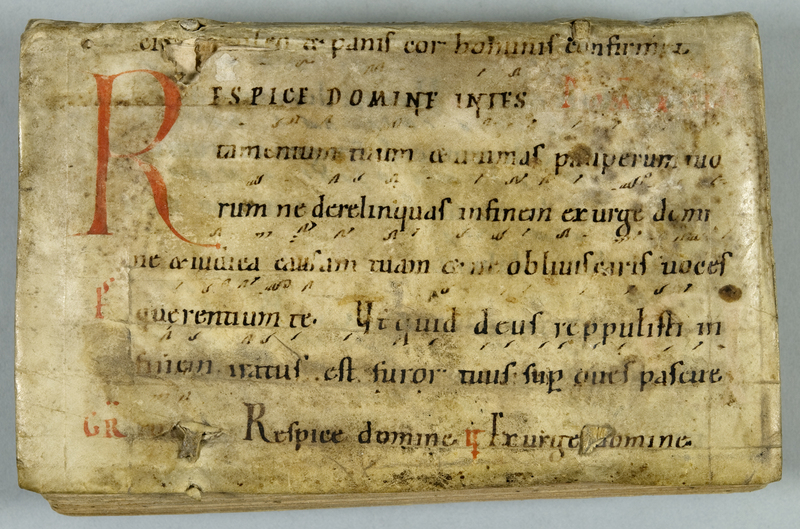 Margaret kept a diary for every year of her life, a hugely impressive feat. 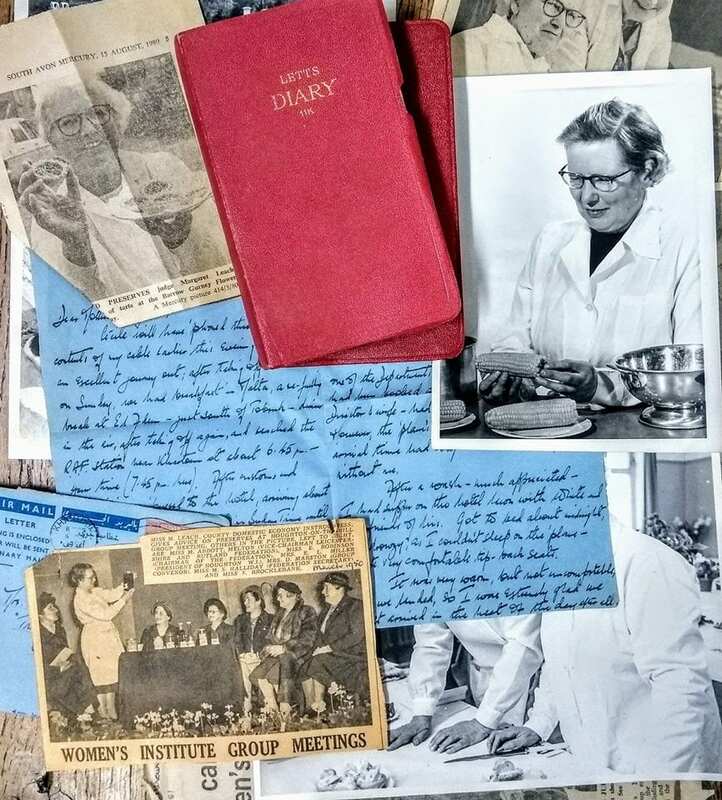 It was strange and wonderful to trace the life of this woman from the age of 11 – with entries on the hours spent in an air raid shelter during WWI – through to her flourishing scientific career and rich retirement. 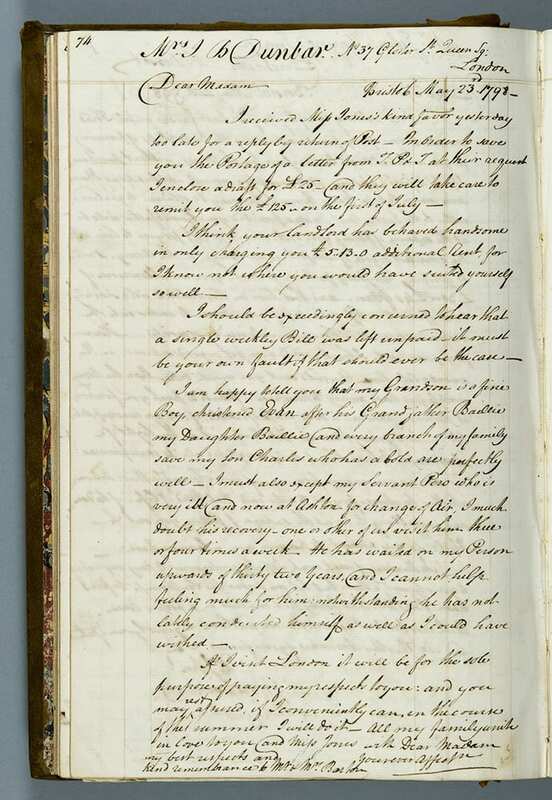 Another fascinating part of the collection are the bundles of letters from Margaret’s brother, Thomas Leach, positioned in Nigeria as a military veterinarian, to Margaret and their mother, and Ida. Reading the accounts of holidays, neighbourhood gossip and correspondence of everyday life it is difficult not to feel privileged by the window of access into the life of this close family. Margaret’s senior role as head of the Domestic Preservation Section of Long Ashton Research Station was the pinnacle of a long and illustrious career. She would frequently travel the UK giving lectures on food preservation to amateur and professional groups. A hugely accomplished person, Margaret is just one example of the many remarkable women whose papers lie in the archives waiting to have their stories told. One of the things I will take way from my two months as intern was the passion and commitment of the team I was working with. 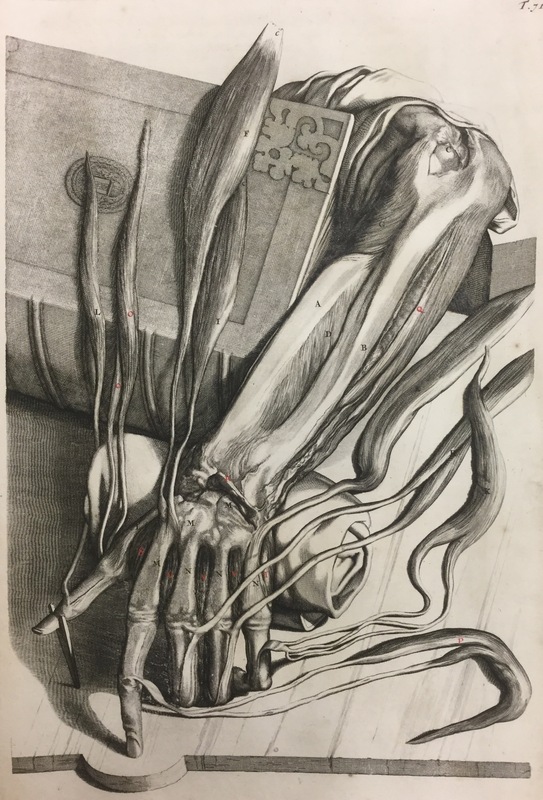 The lengths to which they went to help researchers, as well as their incredible knowledge of the collections, meant that not only did I learn a lot but feel enthused the archive is in the hands of a team dedicated to sharing it with the public. This entry was posted in Uncategorized and tagged FAS, intern, LARS, Leach, Pinney on September 11, 2018 by Jamie Carstairs. 6 February 2018 marks the centenary of legislation which allowed all women over 30 with a property qualification the right to vote. This vote also gave all men over 21 the right to vote. Many argued that this did not go far enough, and it wasn’t until 1928 that men and women could vote on an equal footing. 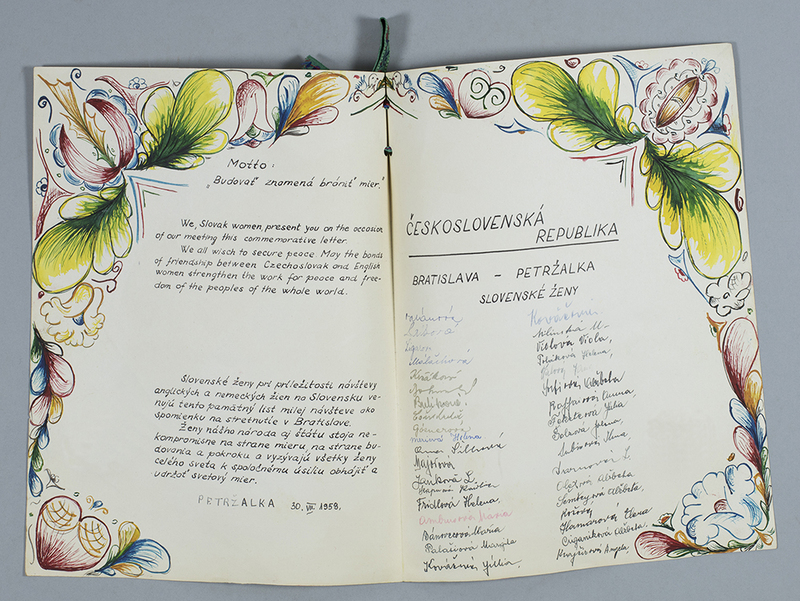 Special Collections, housed in the Arts and Social Sciences Library, and open to all, has such a wealth of materials relating to the politicisation of women, that we couldn’t miss the opportunity to celebrate this date. Have a look at this website to see a copy of the 6 February 1918 Representation of the People Act, which is also available in the University of Bristol Library. And this web page gives more of the story. 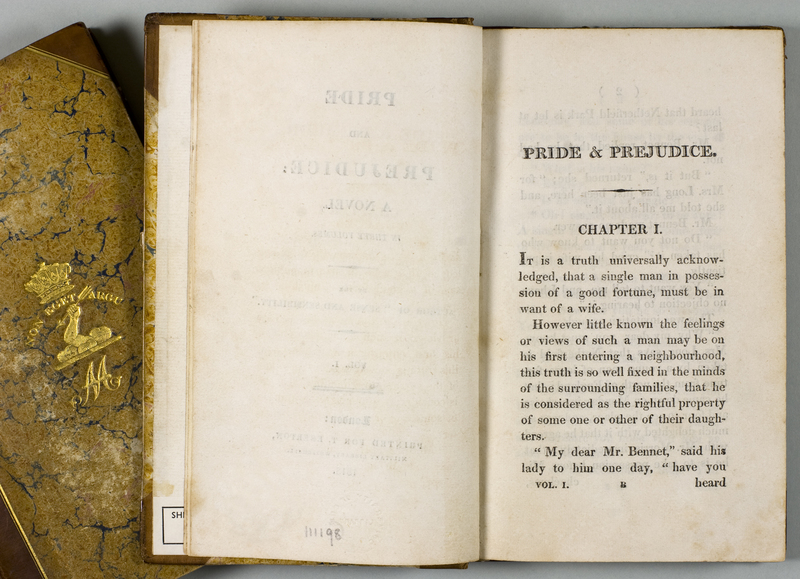 Our online archive catalogue is a good start for an explore as to what we hold. Lucienne Boyce, The Bristol Suffragettes, Bristol, 2013 [available to borrow from ASSL]. 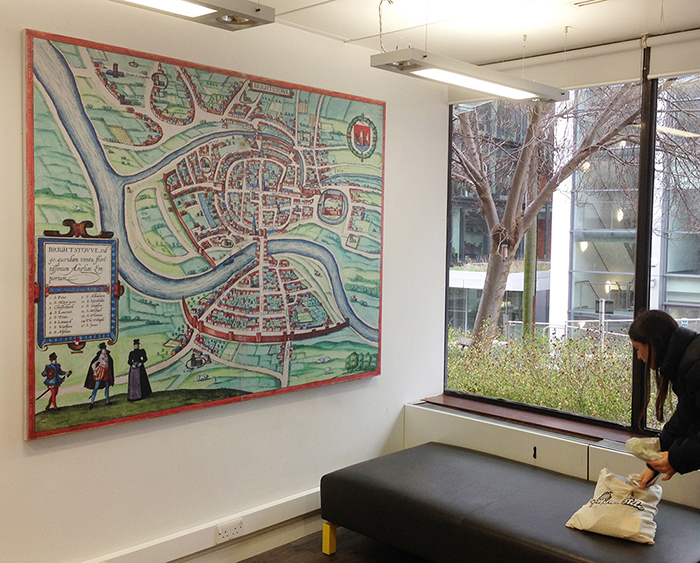 Madge Dresser ed., Women and the city: Bristol 1373-2000, Bristol, 2016 [also available to borrow from ASSL]. University College Bristol was founded in 1876. The College could not award degrees itself, until it became the University of Bristol in 1909, but from the outset women were admitted as students on an equal footing as men. 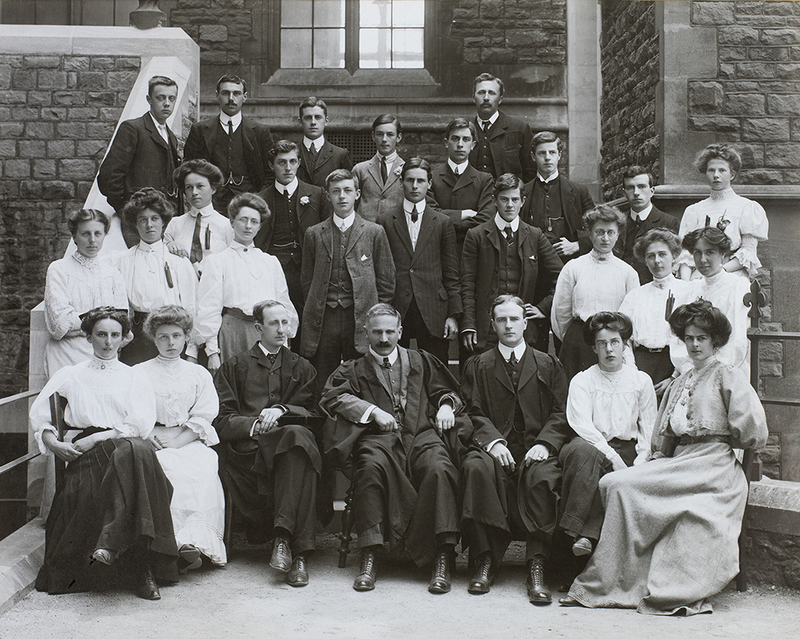 Staff and students, Chemistry Department, University College Bristol, 1907-08. DM2740. 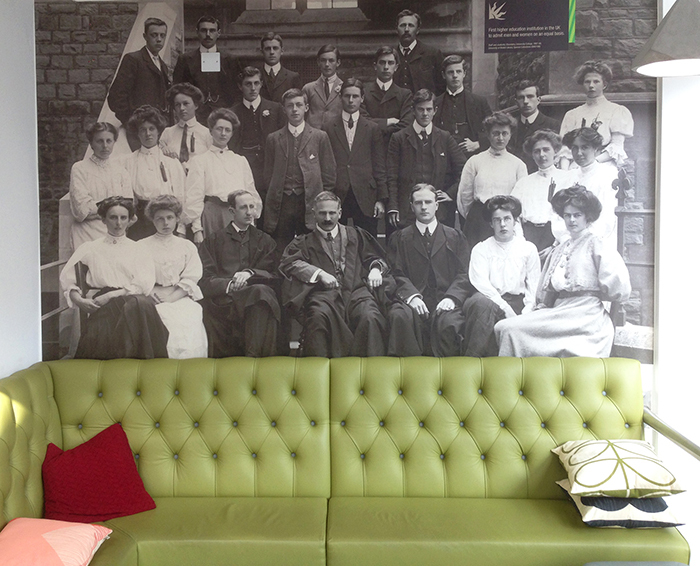 We have evidence of the activities of female students, academics, and administrative staff including one of the first female Registrars Winifred Shapland; Marian F. Pease (1859-1954) who was one of the first women to enrol in University College Bristol; and early female professors such as Lilian Hawker, Professor of Mycology. 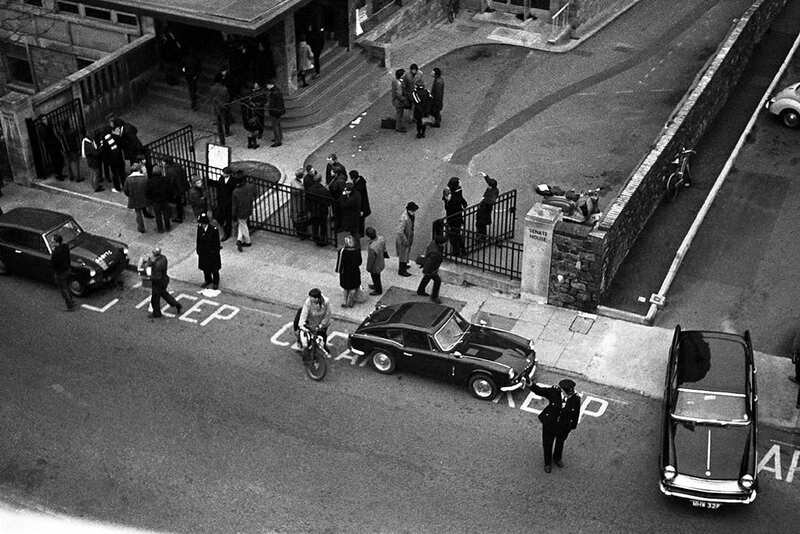 In the 1970s the University Library purchased the Library of the National Liberal Club. 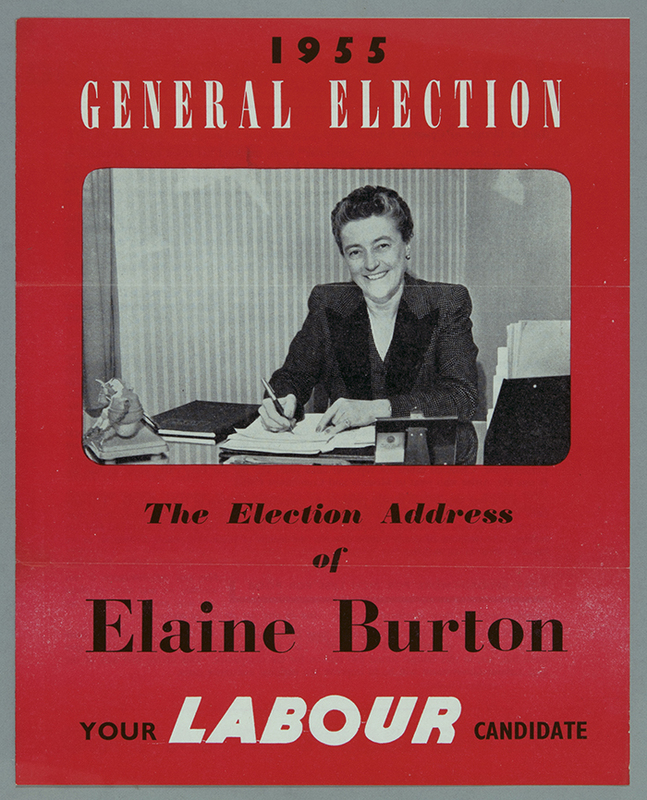 This includes a wealth of materials relating to General Elections and by-elections for the Westminster Parliament. 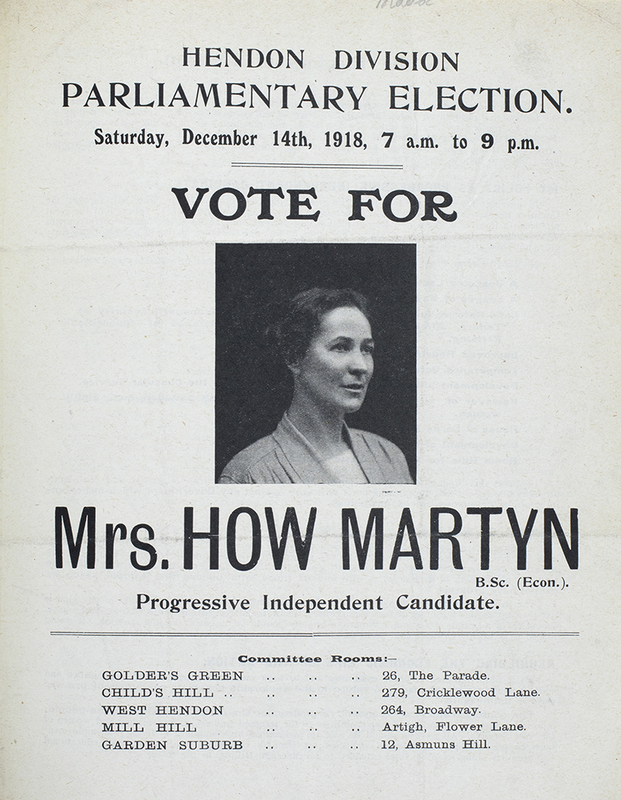 Our 1918 Election Address volume, for the 14 December 1918, includes the leaflets of five female candidates. 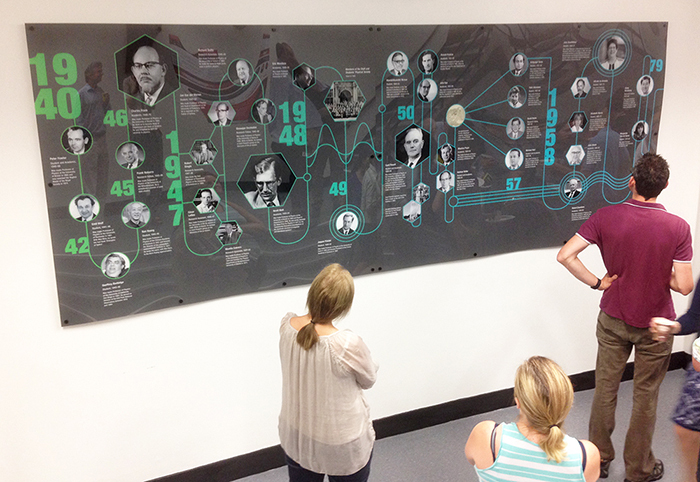 Most candidates mention female suffrage. 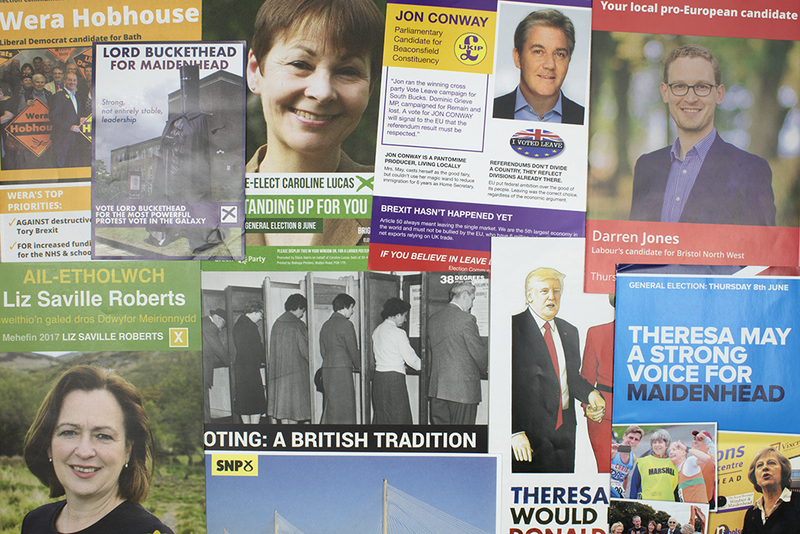 Our election leaflets go up to 2018, so you can trace female candidates from all parties over the years. Election address/leaflet for Mrs How Martyn, Hendon, Progressive Independent Candidate. General Election, December 1918. 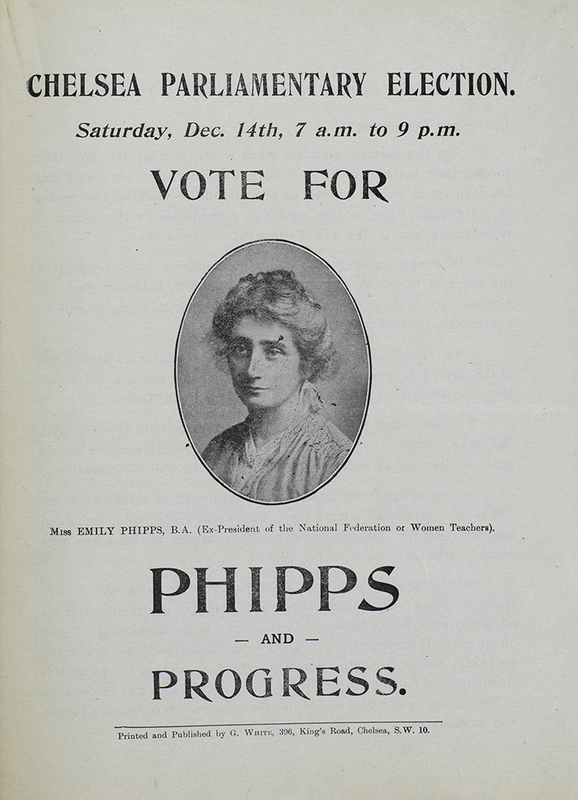 Election address/leaflet for Emily Phipps, Chelsea, Independent Candidate. General Election, December 1918. We hold the papers of Jane Cobden Unwin (1851-1949), DM851, who stood and was elected with one other woman (Margaret Sandurst) as one of the first female County Councillors in the UK in Bow and Bromley in 1889, as Liberal candidates. Her papers also show her campaigning activities on behalf of the rights of indigenous people. 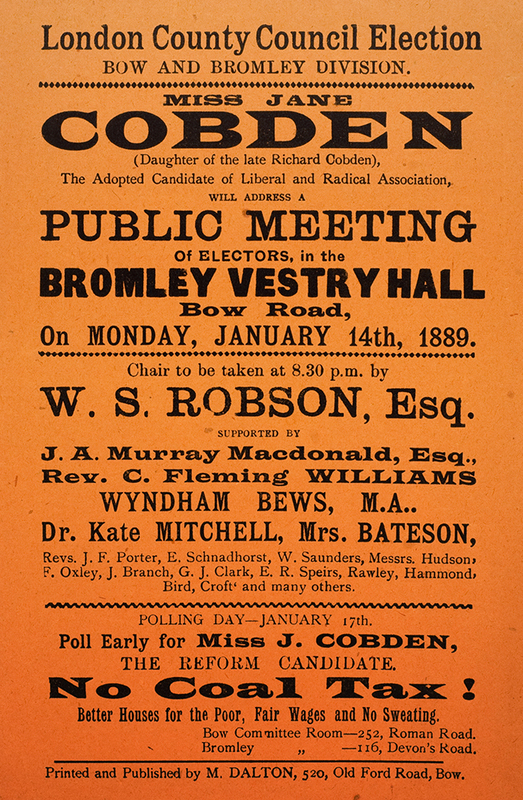 Poster for a public meeting addressed by Miss Jane Cobden. London County Council Elections, January 1889. DM851. We hold extensive papers of the Women’s Liberal Federation, DM1193. Here you can follow debates within the Liberal Party concerning the enfranchisement of women, and the founding in 1913, of the Liberal Women’s Suffrage Union, which supported the cause of women’s suffrage within the Liberal Party. A more recent arrival has been the papers of the Feminist Archive South, DM2123, which covers the women’s movement from c.1969-2000. 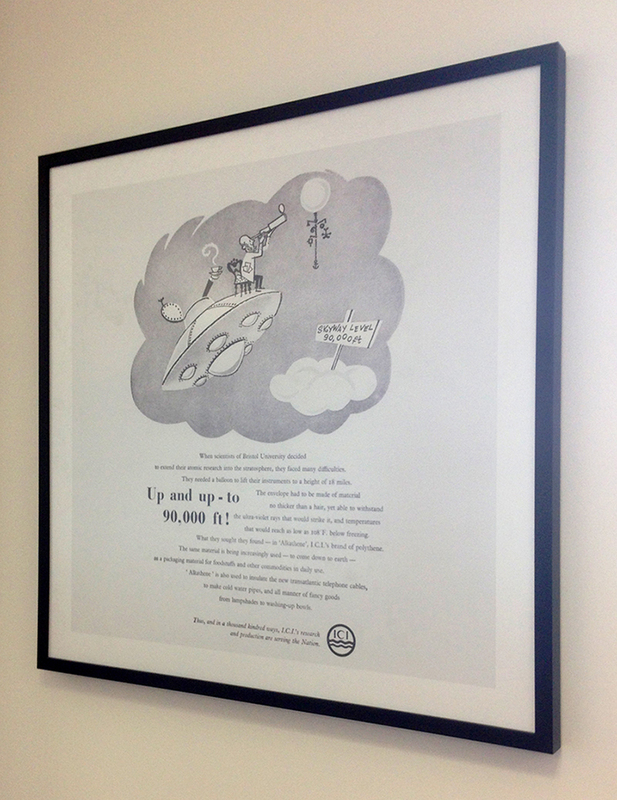 The Feminist Archive South hits forty this year and has been held in Special Collections for ten years. A series of workshops are taking place this spring. If you want to see how women have campaigned and built on the vote from 1918 this is the place to go. Campaigns on all topics under the sun are covered. 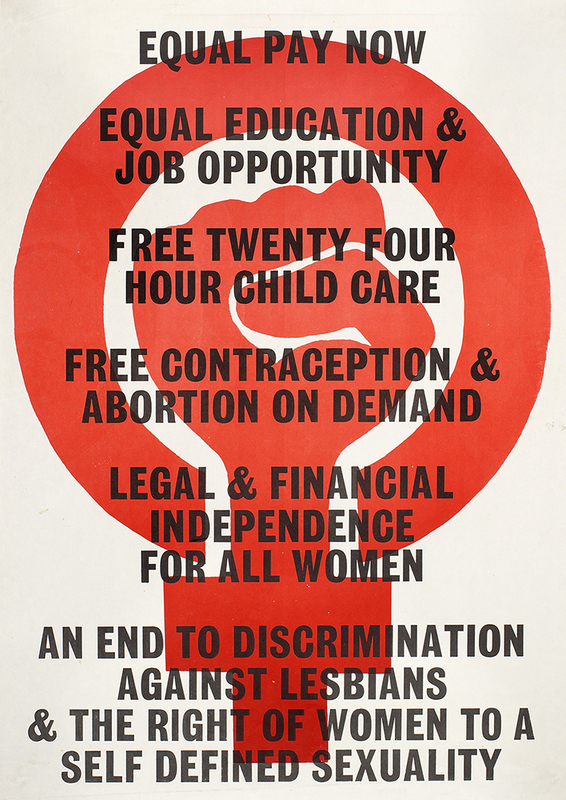 Rights demand poster, 1970s. Feminist Archive South. DM2123. “We all wish to secure peace.” Dora Russell’s Caravan of Peace, 1958. DM2123 FA/Arch 9. 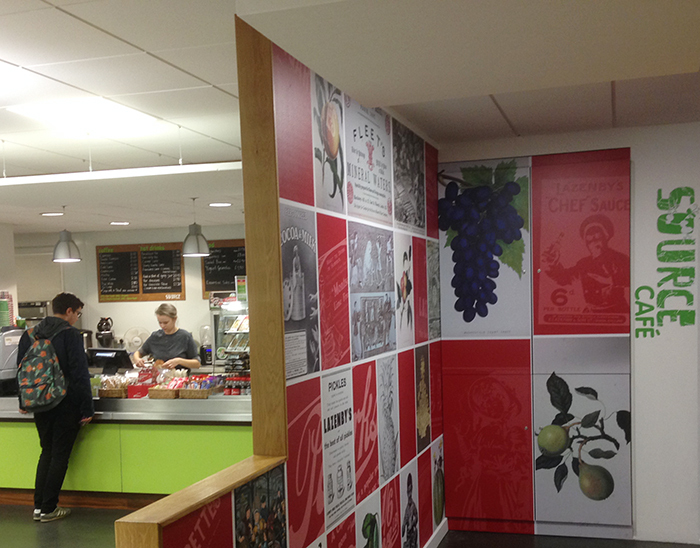 There is some coverage of the Suffragette Movement in Bristol. 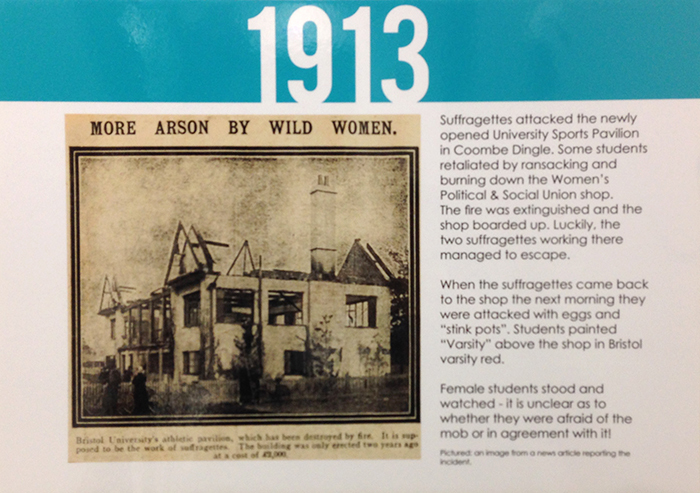 In particular of an incident in October 1913, when University of Bristol students, angered after suffragettes had burned down the Coombe Dingle sports pavilion, attacked the Suffragettes’ headquarters on Queens Road, Bristol. This postcard (DM325) shows the aftermath of the activity. 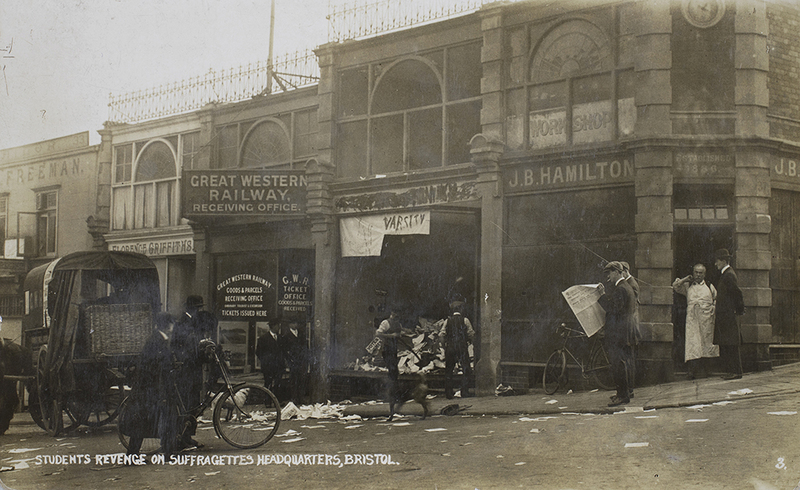 The Bristol headquarters of the WSPU (Women’s Social and Political Union), after being wrecked by some 500 undergraduates, Queens Road, Bristol, October 1913. DM325. This entry was posted in Uncategorized on January 30, 2018 by Jamie Carstairs. 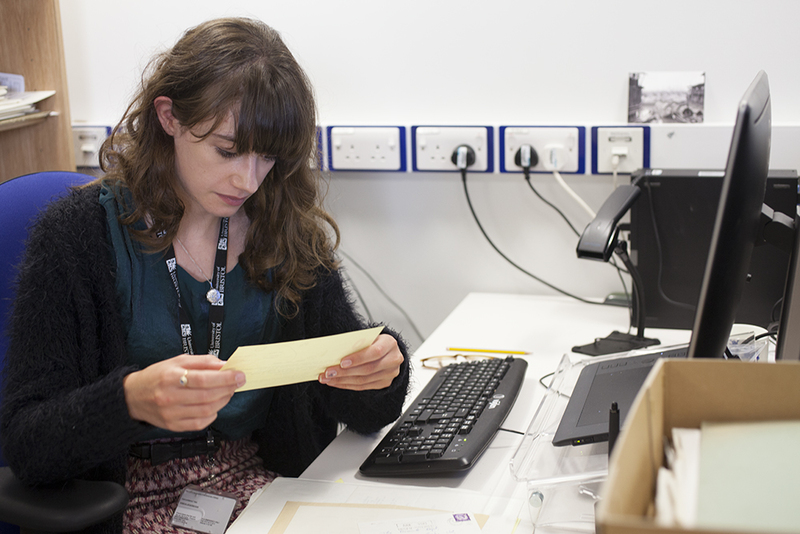 Evie Porat cataloguing part of the Penguin Archive, July 2017. Photograph by Jamie Carstairs. 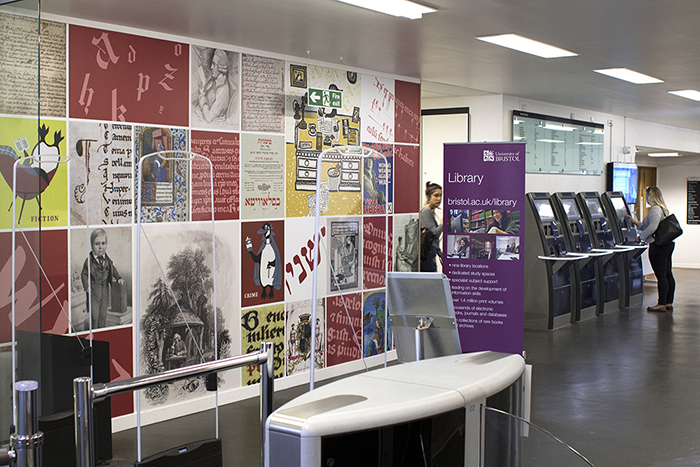 This summer I spent a fantastic ten weeks working as an intern with Special Collections, based in the Arts and Social Sciences Library. 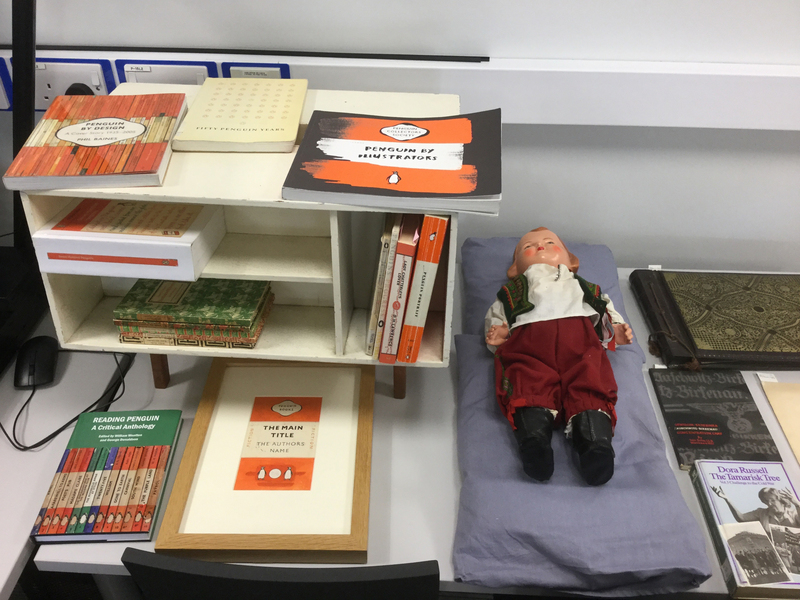 The main purpose of the internship was to catalogue various series of the Penguin Archive, and put them online to make them more accessible to researchers. However, there were tasks associated with the job, and no two days were the same. 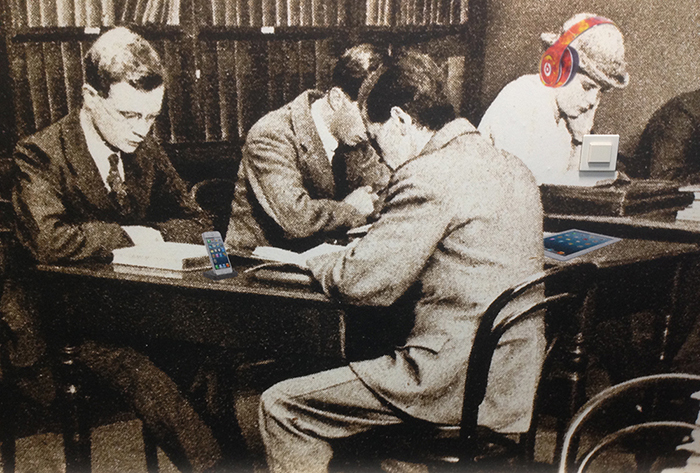 Supervising the reading room, helping researchers in finding relevant material and fetching boxes from the archive were all regular duties. I also had the opportunity to assist with and learn more about digitisation, to sort ephemera from the recent General Election, and to help with an exhibition of Special Collections sources on the history of the University, held at Royal Fort House. 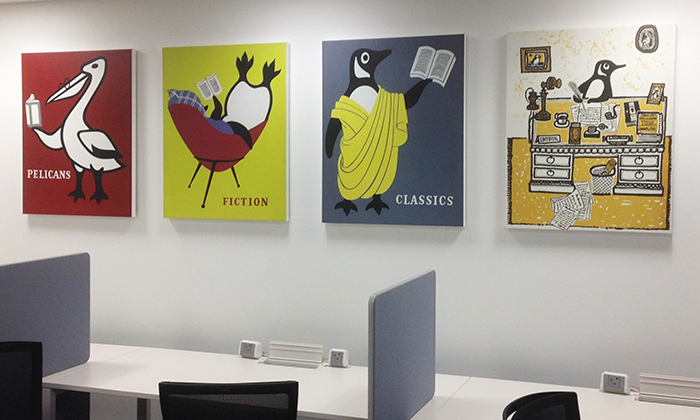 As mentioned above, the main project I worked on was cataloguing the Penguin Archive. 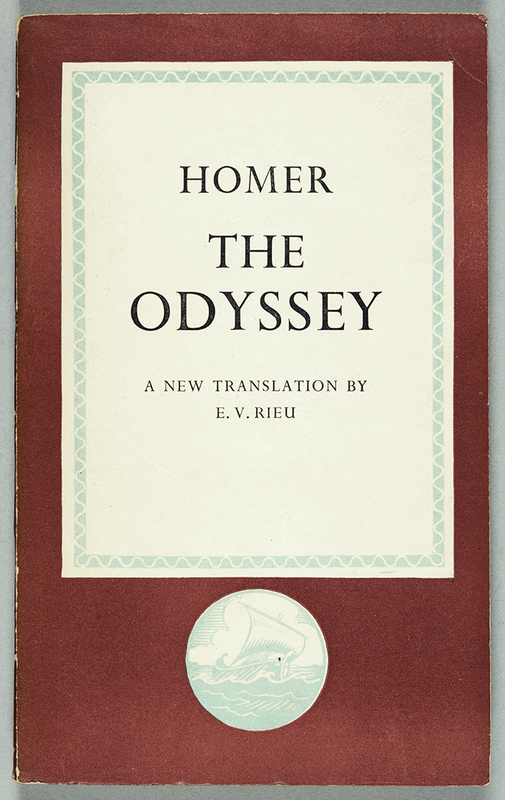 The Archive includes editorial files for books published from 1935 to the early 1990s. 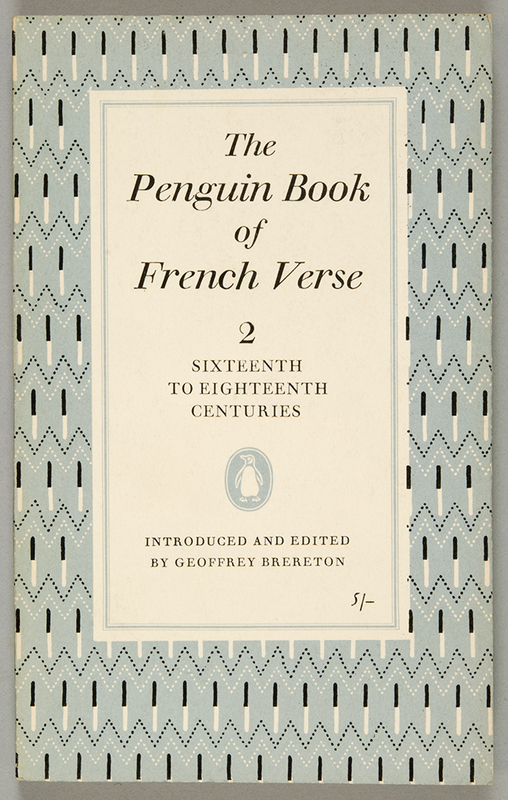 I worked on cataloguing several series: the Penguin African Library, Penguin Classics, the Penguin English Library, Penguin Poetry and Penguin Specials. 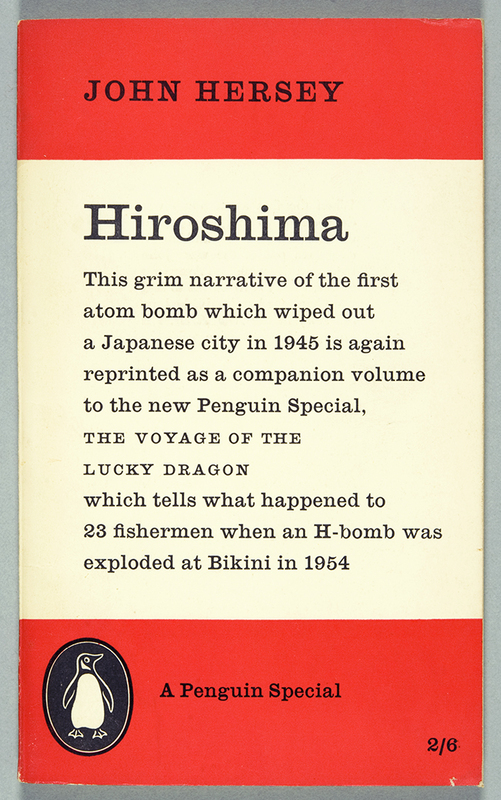 The extents of these series vary greatly: for example, the English Library comprises only 7 boxes, whereas Penguin Poetry consists of 55 boxes. Cataloguing these files required a great deal of concentration and attention to detail, maintained over long periods. There were other challenges, too: getting to grips with the house style, working out how to list files that didn’t follow the usual format and learning how to use the cataloguing software, CALM. A key lesson I learnt during the internship was of the necessity of resisting the urge to get drawn into the history detailed in each file. All the series are fascinating, and I could have easily spent hours reading correspondence with some of the Beat poets (DM1107/D78), or poring over Bertrand Russell’s correspondence with John F. Kennedy and Nikita Khrushchev regarding the Cuban Missile Crisis (DM1107/S220). By maintaining a level of detachment, however, I managed to catalogue 121 boxes of files during the period of the internship. As well as being educational, the internship provided me with great practical experience. As a result of my time with Special Collections, I am convinced that a career as an archivist is the right path for me, and I will be applying for a Master’s degree in Archives and Records Management. One of the things that made my time with Special Collections so worthwhile was all the help and advice I received from the department’s staff, who were all incredibly generous with their time. I am very grateful for the excellent experience they gave me, and should a similar opportunity be advertised again, I would not hesitate to recommend it to anyone who is considering a career as an archivist. This entry was posted in Uncategorized on October 9, 2017 by Jamie Carstairs. The University of Bristol Special Collections has an extensive collection of election addresses (over 30,000) relating to British General Elections from 1892 to date. There is also extensive coverage of by-elections. We also hold election addresses for European Elections 1979 to date; and the London County Council elections 1889-1913. With the General Election having been called for Thursday 8 June 2017, we would like to appeal to people to collect what comes through their doors, and to send it to us at Special Collections. 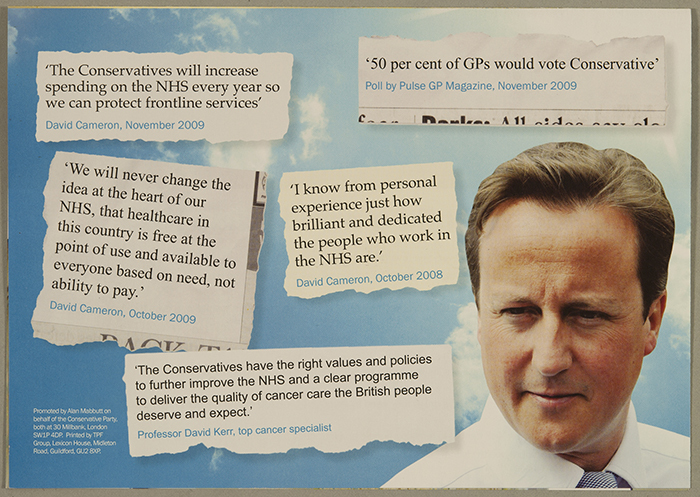 We collect in all Westminster Constituencies (all 650 of them), and cover all political parties (both big and small). We would welcome donations from members of the public, political parties, or the parliamentary candidates themselves. 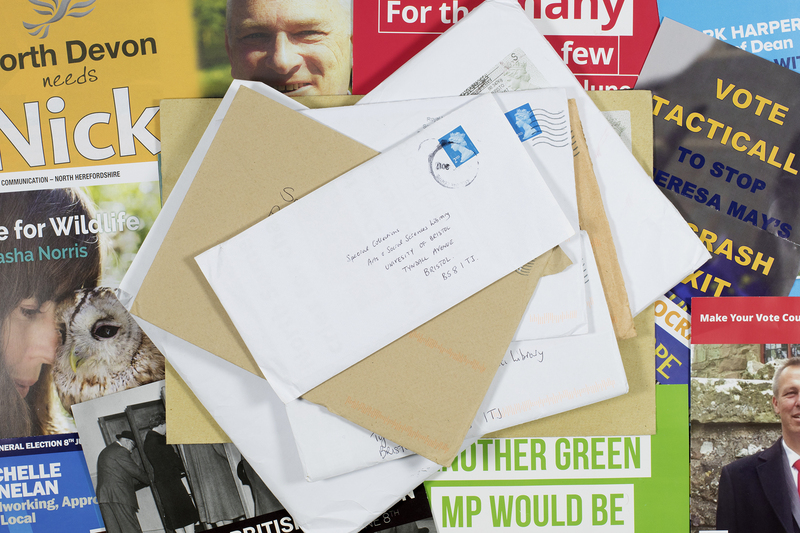 We collect election leaflets/addresses, manifestos, and related publicity. Please bundle up what comes through your door, and send it to us after the Election, in an envelope with a note of where you received the material, ie. 1 Tyndall Avenue, Bristol, BS8 1TJ. We really appreciate this, and hope that it is of interest. By collecting you help the academic community, politicians, independent researchers, and others in the future see what was really discussed in the 2017 General Election. Thank you. 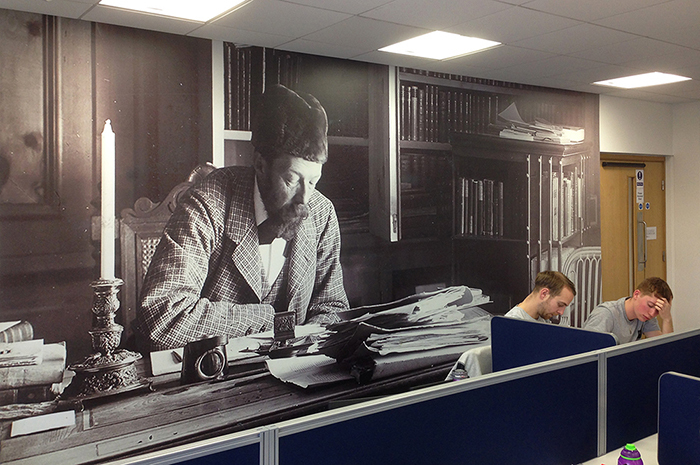 Special Collections is happy to have provided images for refurbishments around the university. 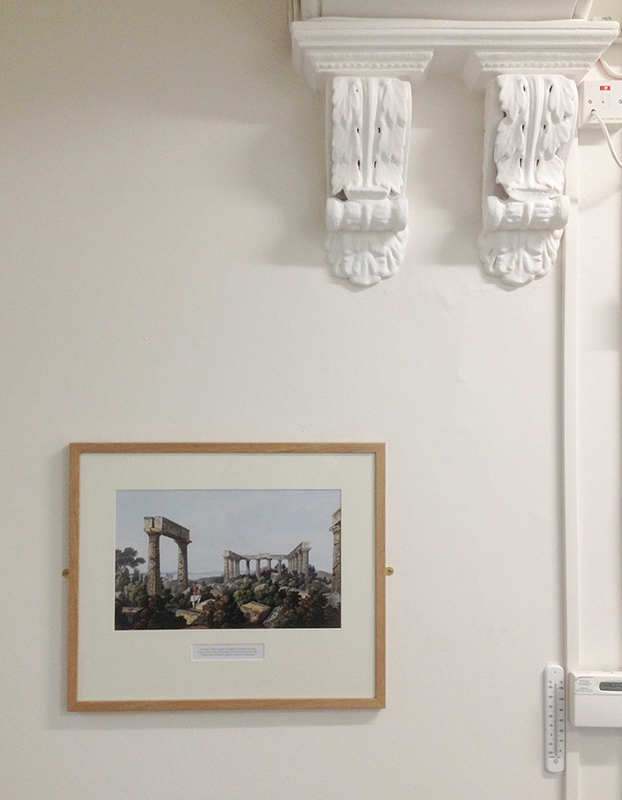 We have been involved in refurbishment projects in Senate House Study Centre, Grace Reeves Study Centre, the Richmond Building (Bristol Students’ Union), Beacon House, Arts & Social Sciences Library, Physics Library, H H Wills Physics Laboratory – and also provided 29 images and arranged their framing, in departments of Classics & Ancient History, English, Religion & Theology, and HUMS administration/staff areas. This entry was posted in Uncategorized on January 20, 2017 by Jamie Carstairs.